To feed your baseball or football player you need a strategy and a plan of action! I am constantly cooking meals to satisfy my son’s hunger. If you know my son, you know he eats more than a grown man and has since he was about 8! My mom would say if I am inviting Hunter to eat I better cook for 2 more people! He can take down a whole footlong sub at subway and still be hungry! I have figured out some meals that really help to satisfy his hunger while giving him a healthy meal. I keep avocados, eggs, hardboiled eggs, cheese, sandwhich supplies, peanut butter, protein powder, chicken, rice, material for enchiladas, lasagna, chili, and salads. Plus, we go through 4 gallons of milk every week. Hunter came home from baseball tryouts starving and I had to think of a fast, but filling meal with the ingredients we had in the house. He asked for Chicken Talavera (like what he orders at La Carrata, a great Mexican restaurant in the Lynchburg area) and I trying to rack my brain of how I could make this happen. So, I went on a hunt for ingredients and found two bags of large frozen peeled and shelled shrimp! I ran them under cold water in a strainer and in no time was ready to roll! When it is 7Pm and you have two men looking at you like they haven’t eaten in 10 days you better hurry! We always keep Basmati Rice on hand, so I started a boiling the 3 1/2 cups of water for 1 1/2 cups of rice. Set that off to the side while it boiled and reduced to the perfect finished rice. In a huge cast iron skillet (my grandpa used to show us how to cook on these all the time), I tossed a chopped up Vidalia onion and 1 tablespoons of butter with 1 tablespoon of coconut oil to the pan! Heat that bad boy up and toss in the 2 bags of shrimp and a splash of lime. (I have a whole bag of limes and lemons on hand at all times to put in meals or my water!) Then reduced down the sauces and sautéed the shrimp with onions. I poured the juices in the finished rice to the side and then browned the shrimp with 1 more tablespoon of added butter to the pan to add a crisp brown flavor to the shrimp and onions. I added a splash of Corona Light to the pan to pick up all the good pan flavors and add some heat. So what do you do with the other half of the beer…you drink it! I then added 1 cup of salsa, 1 cup of chicken broth, some Mexican spices like of course old bay, a dash of cumin, a little garlic powder, salt of course and the best part is a secret spice made only by my sister’s husband! (He is the meat man in the family and creates spices like no one I know, so of course that goes into all my dishes.) Then, I added a bag of frozen carrots, peas, and corn to the pan and reduced down the liquids again to steam the frozen vegetables and last but not least I put in the rice and let the sides get a little brown and crispy…We all fight over the crispy sides. I even made a Homemade White Cheese sauce consisting of 2 slices of American cheese, 1/2 bag of Mexican Cheeses found at Kroger in one bag, 2 tablespoons of butter, and 1/2 cup milk with a splash of cumin and stirred to get the right consistency! I honestly surprised myself with this one! I poured the cheesy goodness over the whole entire top of the pan and let is settle in! I chopped up an avocado to put on top along with extra salsa and some sour cream. The boys were first to scoop up there meal and not one single grain of rice was left in this huge skillet tonight! SAVE FOR LATER. Most of the time we do plan to make extra and I did tonight, but sports have begun again and that means no more extras! So, normally I get out a container and put in a little of what I made. They may think the food is all gone, but in reality, I saved at least one person’s snack or my lunch for the next day and they think that was all we had! So if there is 8 chicken breasts after giving each one of us one, I take one and put it away..the out of sight out of mind method! This helps us from really overeating and makes sure we have food for the next mealtime! KEEP KEY INGREDIENTS ON HAND. What would I have done if I didn’t have a starch, meat, and veggie in my kitchen? If you have kids or even are just cooking for you and your husband, you need to keep some key favorites on hand. Just like I did tonight, its so easy to throw it all in a pan and serve it up! GET CREATIVE. Your kids will always have wild ideas of what they want to eat, and you will need to satisfy their craving! Be confident and try something new like I did tonight! Now, its a family favorite! I hope this helps you out and just so you know the breakdown of this meal was super cheap and very flavorful! Of course, you can make it with chicken or shrimp, but it was so DELICIOUS!!! Total Meal to Feed 5 Hungry Athletes $23.20 divide that per person $4.64 AMAZING you can’t have a Subway 6 inch for that and you would be hungry 30 minutes after! Support your kids on the field! 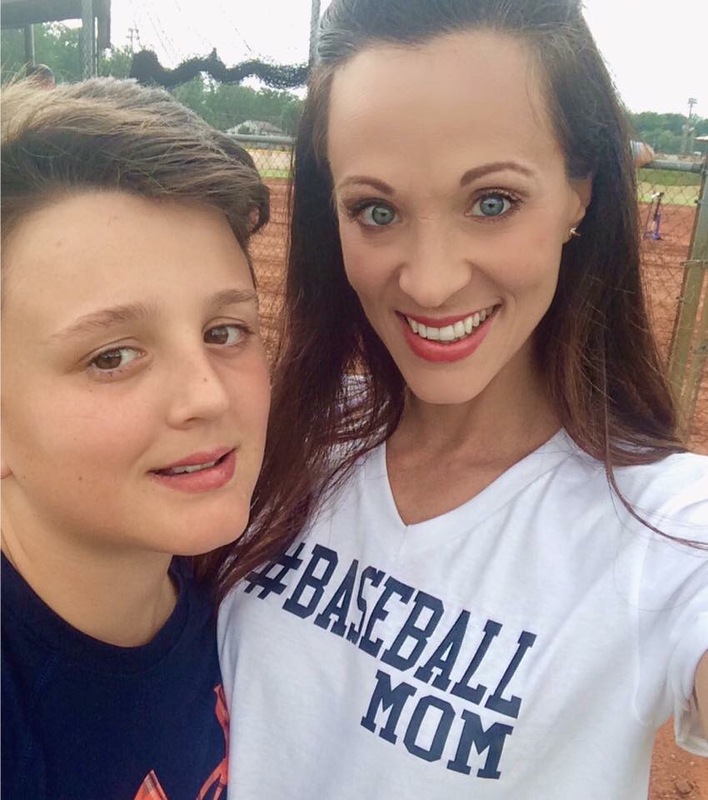 If you want to show your #BaseballMom pride, you can purchase one of these shirts to show your boy some support. They are $16.99 (+ local drop off or shipping). I am also taking pre-orders for #SoccerMom shirts! They will also be $16.99 so let me know if you want one! Message me or email skrycinski@yahoo.com to order! What’s your favorite go to meal? !